April 19, 2007: Cloudy and cool, Water Temp 52* and clear. Picked clients up at 5am because they wanted to learn how to catch bait. Caught bait easily and set up on a long 12'flat on a primary point and pulled 10 boards , a bobber and a downline. In less that 10 minutes we had a board back up slowly only about 3' and it looked like a Catfish was working the bait. After a minute I told client to reel it in and he got it all the way back to the boat before it knew it was hooked. 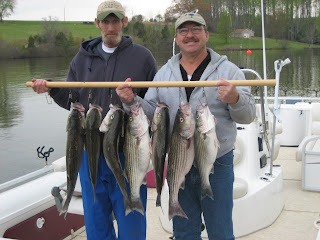 I write this because a Striper usually will jamb the bait and pull drag immediatly but the fish were lethargic and only wanted to mouth the bait. We worked the flat and continued to have these passive hits, some hooking up and others not. After awhile I pulled out and worked other areas trying to find some aggressive fish but the fish seemed to turn off after 11am. We had 24 hits today, Tommy catching most of his and Dave , well he must have felt sorry for the fish a little. Clients kept 7 Stripers and had a Great learning experience.